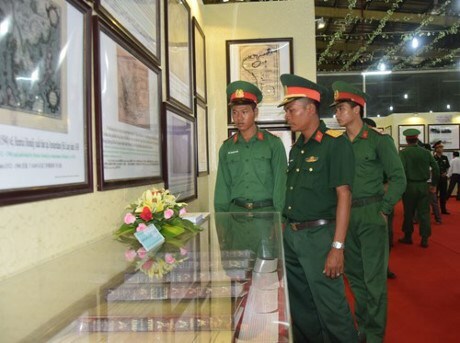 Soc Trang (VNA) – An exhibition entitled “Hoang Sa, Truong Sa of Vietnam – Historical and legal evidence” opened in the Mekong Delta province of Soc Trang on August 25. On display are more than 200 maps, photos and documents published from the 17th century to the 20th century, proving Vietnam’s sovereignty over Hoang Sa (Paracel) and Truong Sa (Spratly) archipelagos as well as the country’s exercise of sovereignty over the islands. In addition, the exhibition also showcases four atlases published by China’s Qing Dynasty and the Chinese Government in 1908, 1917, 1919 and 1933, defining Hainan island as China’s southernmost point. The event is designed to raise awareness and enhance solidarity and responsibility of local people and overseas Vietnamese, especially youths, in protecting Vietnam’s sovereignty over the Hoang Sa and Truong Sa archipelagos.